World Services Public Relations Handbook. service boards or committees directly responsible to those they serve." always review itself periodically. Service committees, like individuals, often vary in personality. Some grow and thrive, while others struggle to survive, and some even fail. ​A service inventory will help the North Dade Area keep things on track. adherence to the Twelve Traditions of NA. scheduled at other times if it is desirable to re-focus the Area on its mission. * How did I do in the performance of my duties? * Do I show up? 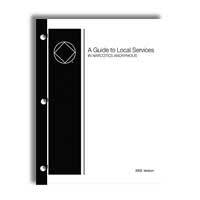 Guidelines, the Guide to Local Services, or the person who held this position before me? * Do I do what I am supposed to do? * Do I represent my group's conscience? * How did the North Dade Area do in performance of its functions? help my meeting or subcommittee resolve any problems it may face? * Do the North Dade Area subcommittees serve the needs of my meeting or NA as a whole? or NA as a whole? reminding us to place principles before personalities”. message of recovery to be carried through the services we provide. ​When we respect each other, even though we might disagree, and adhere to the principles stated in each of our Traditions, are a unified entity serving the fellowship of NA within the North Dade Area. ​maintains services on behalf of NA as a whole. ​to fulfill the responsibilities assigned to it. ​of decision and accountability should be clearly defined. ​consider all viewpoints in their decision-making processes. ​a personal grievance, without fear of reprisal. ​structure should always be one of service, never of government.